In trickling filters and submerged fixed and moving beds, GEA 2H BIOdek® fills and GEA 2H random media have proven to be a reliable basis for biofilm processes in municipal and industrial waste water treatment. They are as well used in recirculation aquaculture systems (RAS) in indoor fishfarming plants. GEA’s great variety of different materials and fills with all kinds of shapes and surfaces enable the engineer to select the type suited best for his application. The structure and the high specific surfaces from 70 to 320 m2/m3 of GEA 2H BIOdek® cross-fluted fills are perfectly adjusted to all requirements in biological sewage treatment processes. Different shapes of the fills allow growing thin or thick biofilms depending on what the process requires. GEA 2H BIOdek® vertical flow fills form vertical channels and have open interfaces. Thus the sludge of thick biofilms does not accumulate and solids are easily expelled. 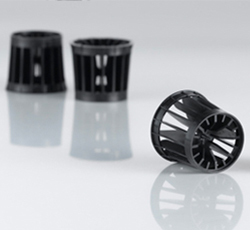 The fill’s reinforced edges increase the bearing capacity and give a high resistance to erosion. 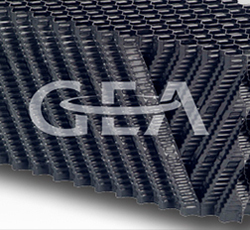 GEA 2H BIOdek® Fills with tubular design are used for biological water treatment and nitrification by contact aeration and for the separation of oil, fat and hydrocarbons. The fill consists of uniform parallel pipes (Tubes) with hexagonal shape. 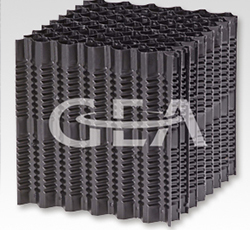 This design makes the GEA 2H BIOdek® FAP specifically resistant to blockage and easy to clean. 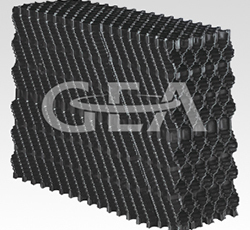 GEA 2H random media are installed in submerged moving bed reactors in municipal and industrial waste water treatment. They provide large specific surfaces for the growth of biofilm and feature an extremely high mechanical stability.